This is the first of four posts covering the Skype Shop – an introduction, qualifying products offered, learning about an individual product and, finally, making purchases and follow-up. When it comes to making Skype calls it’s really a combination of the Skype software and any co-requisite PC-based audio/video hardware required to complete a call. But to get maximum performance, such as audio quality and video resolution, during a Skype voice or video call often requires peripheral hardware meeting specific audio and video standards. 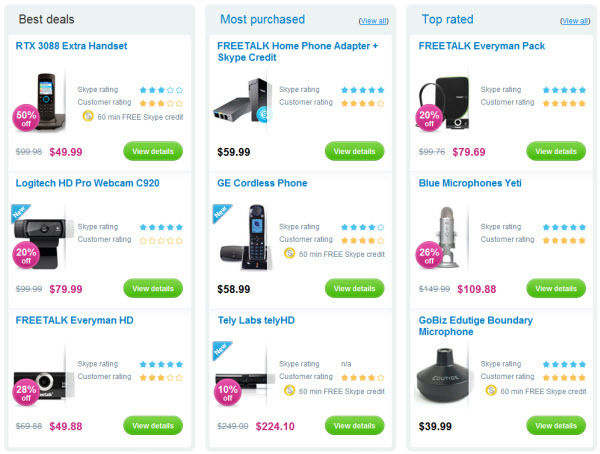 Many hardware vendors offer headsets, speakers, microphones and webcams with unique features that enhance call quality. As Skype is really a software company that does not want to get into the hardware business, they have worked with several hardware vendors who have been qualified to offer Skype-certified hardware. Selling and distributing this hardware around the world presents additional challenges. And then it has to be easy to find and purchase the hardware from an individual user’s geographical location. Other issues that need to be addressed include languages, currencies, local taxes, physical distribution/shipment and customer support (addressing both purchase transaction and technical issues). 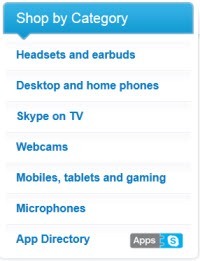 In 2006 from user feedback Skype realized they needed to establish one location on their website where users could acquire the relevant hardware. While much of the hardware can be purchased in retail stores in some countries, it limited product selection; users want to be able to buy the best performing hardware. Also many users simply wanted the convenience of online purchases. Finally Skype had to ensure that any hardware promoted would meet certain quality and performance standards to optimize the user experience. 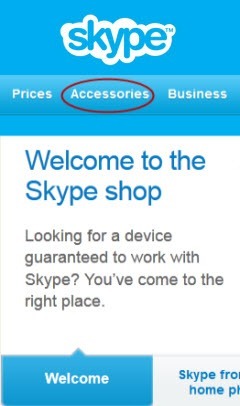 Six years later, mid-February 2012, Skype has relaunched the Skype Shop with the primary goal of making it easier to purchase devices; it can be accessed from Accessories on the Skype website home page main navigation bar. A slider which features three selected products in addition to a Welcome slide. The featured products will change over time. 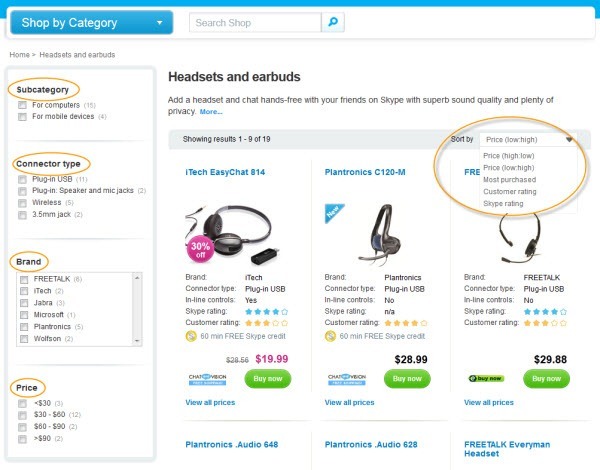 Filters on the left allow the customer to select a subcategory: device (PC’s or mobile), connector type, brand and price. On the right is a drop down box with “Sort by” options for displaying the various products. All of the products meeting the left hand filter criteria will be displayed on the resulting catalog page. Webcams for Skype on TV required a unique filtering option. With the exception of the recently released TelyHD that works with any HD TV set, Skype for TV webcams are designed to work with individual TV set manufacturers’ “smart TV” firmware; industry standards for connecting to peripherals from this firmware are still being established. 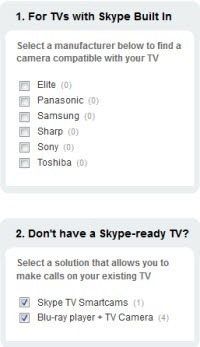 To eliminate any confusion when selecting the Skype on TV category, the navigation panel filters for the specific TV vendor or type of product under two sub-categories as shown on the right. Purchase and follow up – e-commerce stores, customer service (following up the transaction) and technical support. Posts covering these topics will form the balance of this series. The App Directory: In addition to hardware the Skype Store also supports the sale of applications that enhance the Skype user experience, such as call recording and integration with other software applications. The App Directory, launched last summer, is described in more detail at Whither Skype Extras III? On the Skype Store Apps Page. Update from Ash Valeski, Skype’s Global Shop Manager:Welcome to the Updated Skype Shop.